Due to the dry climate of Southern California, water conservation plays an important role in sustainability at UCLA. Faculty from across the university are collaborating as part of the UCLA Water Resources Group and the Grand Challenge to address this critical issue for our region and our state. 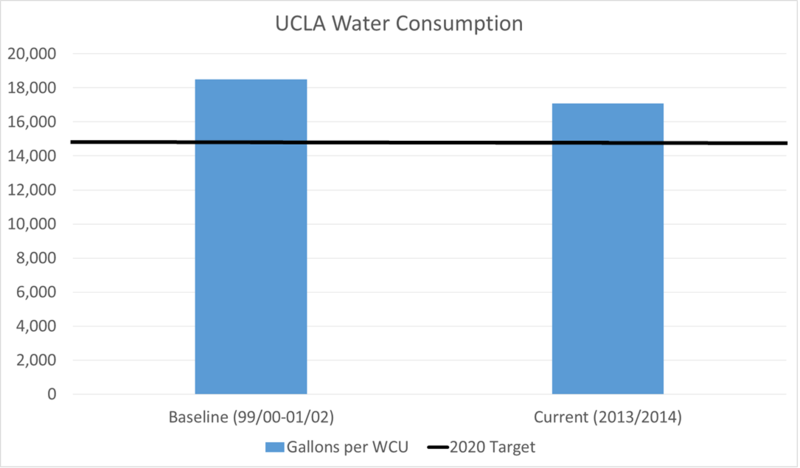 UCLA’s water conservation efforts have reduced annual water use by over 70 million gallons since 2000, bringing us about half way to our 2020 target. Our comprehensive approach to water conservation includes water recycling, high efficiency fixtures such as ultra-low flow urinals, drought tolerant landscaping, and smart climatologically-based irrigation and drip irrigation. The UCLA Water Taskforce, a group that includes staff and administration from Plumbing, Energy Services, Capital Programs, and the Medical Center, as well as faculty from the Engineering Department drafted the UCLA Water Action Plan in January 2014, detailing initiatives that will bring us to our 2020 goal. These initiatives include artificial turf on the IM Field and a filtration system developed by UCLA engineering which will be used to treat water for re-use in our cogeneration plant. Click here to read the UCLA Water Action Plan. An update to the plan will be released in 2015. Click here to read the letter from Chancellor Block to the campus community regarding the drought. More information on California’s drought and how you can conserve water on campus can be found here.